Prevent the spills and stains in daily life from taking a toll on your home with our selections of waterproof flooring. Isn’t it time to have an interior that is easy to maintain and requires little time and energy to clean? At our flooring store, we have you covered. Our store is proud to offer waterproof carpet and waterproof vinyl flooring that keeps up with your demanding household. Streamline your cleanup efforts and have confidence in your home with these floors. Our dazzling array of flooring options ensures you attain the option you want at the right prices. Your home is where life happens. Everyday life impacts the cleanliness and freshness throughout your home. Spills, dirt, and accidents from pets take their toll on your flooring. Choose from our waterproof collections to keep your property looking neat, clean, and sanitary. Our flooring options incorporate the latest in stain-fighting technology so you can enjoy a cleaner flooring surface in every part of the house. Using waterproof backing and non-porous surface technology, these flooring materials are proven to resist the absorption of liquids. As a result, spills are easier to clean and blot out over traditional materials. Waterproof floors are also an investment in your family’s health. The resilient backing of carpet and tile ensures water and moisture are unable to seep into the subfloor, thereby halting the cultivation of mold and mildew. Breathe easier and live cleaner – a waterproof floor gives you fewer things to worry about. Carpet flooring has earned a reputation for its soft texture, comfort, and variety of colors and designs. Enhance your interior with waterproof carpet. This material incorporates everything you appreciate of this traditional flooring material, while including durability to match today’s home. Waterproof carpeting includes a resilient backing that prevents spills from penetrating the subfloor layer. As a result, you have more time to clean the surface of a carpet, keeping your interior neat and tidy. Our store is proud to carry a variety of waterproof carpets that are sure to match your design sensibilities and budget. Thanks to our wholesale approach to buying and selling, you are better able to plan your remodeling project. 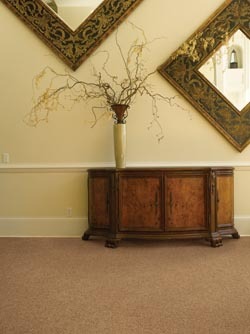 We feature carpeting from well-known brands and manufacturers, including Shaw™ and Tigressa™. Many homeowners turn to tile flooring, specifically luxury tile, since it offers adaptable aesthetics at economical rates. Waterproof vinyl flooring provides the opportunity to give your home enhanced visual appeal while providing peace of mind. Vinyl flooring is available in styles that closely resemble hardwood and stone. This allows a natural-looking visual effect while remaining non-porous. Therefore, waterproof vinyl flooring is a smart choice for homeowners who are looking for a tough flooring material that still reproduces the majesty of Nature. Choose a company that is committed to your total satisfaction. We are available to conduct complete waterproof flooring installation services that work according to your budget. Whether you need to cover one room or your entire property, our team strives to fulfill your project deadlines. We have the training, skill, and equipment to ensure your new flooring looks how you want it, when you want it. Contact us today and improve the strength of your property with waterproof flooring. We proudly serve clients throughout Billings, as well as Eastern Montana and Northern Wyoming.